Martin Dubbeling is interviewed for an article in Scape Magazine that addresses the history and virtues of ISOCARP, the International Society of City and Regional Planners. This article ’50 years of ISOCARP, Planning without borders’, describes the past, present and near future of ISOCARP. When ISOCARP was founded in 1965, population of western cities increased rapidly. It became clear that town and regional planners had tasks beyond housing and that good planning was important to stimulate economic development, to manage social change and to tackle environmental challenges. 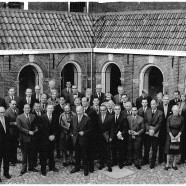 The inaugural congress was held in the Netherlands. In 2015 the congress will come home, exactly 50 years later. In the past five decades, ISOCARP has grown into a worldwide platform where planning professionals form all corners of the world and from all ages and backgrounds share their knowledge, experience and passion for the planning profession. 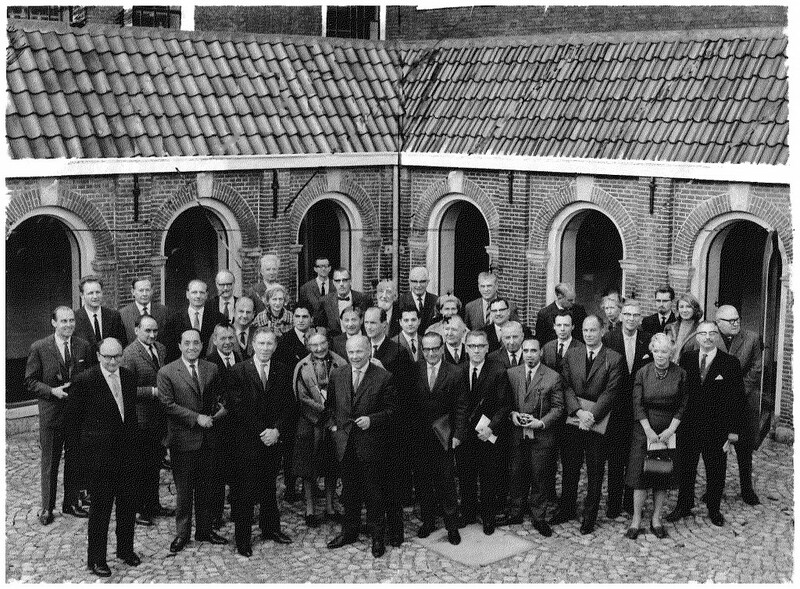 Photo of the founders of ISOCARP in Amsterdam in 1965. ‘Here we are on the horns of a dilemma,’ van Embden continued, ‘for there is no doubt whatever that we simply cannot stop, or even slow down, planning and organizing without immediately endangering the existence of the three, soon six billion inhabitants of this planet. But the more these planning-systems will extend and tend to organise their lives, the more each separate individual will feel exasperated and the stronger it will oppose the restrictions laid upon it in the name of the Community. The only answer I would know to this dilemma for the moment refers to a renewal of our mental disposition. In the first place it concerns those who have to accept planning, but also (and from our point of view this is the most important side) of those who are actively involved in the planning-work. For all of them the main objective should be to find out how to plan freedom. In my opinion this means: to learn how to plan as if we were not planning. This is more a question of mental attitude than of method, more of wisdom than of knowledge. To this, just as to every other really fundamental problem, there is no real and lasting answer. Each new generation will meet it under another appearance, each generation will have to find its own solution. We should search for ours.’ Today, these words of van Embden are as topical as 45 years ago. ‘I noticed in the recent UPAT workshops that Chinese cities and regions are growing so incredibly fast that Chinese planners have difficulties in being and working well ahead of current developments,’ adds Martin Dubbeling, urban planner and designer at Connecting Cities and Vice President Urban Planning Advisory Teams of ISOCARP. He lead several advisory teams and one that with a team of senior experts of the Urban Planning Society of China last year jointly helped and advised the Nanjing Urban Planning Bureau with their assignment from the Chinese central government to plan and develop Jiangbei New District. This district is destined to be one of the motors of economic development in Jiangsu Province in the next decade. For this area of roughly 2000 km2 and situated north of the Yangtze River, strategic plans are in the making for new industries, new CBD’s, university campuses, residential areas for 4 million people and two new airports. Dubbeling: ‘During our site visits we learned that the new area was situated in the floodplains of the Yangtze River, that there already were 1,5 million people living there and that the region was scattered with heavy and polluting industries. We also learned that in the planning area metro lines were planned and under construction by the Nanjing Transport Planning Authority without direct involvement of the Nanjing Urban Planning Bureau. And finally we learned that our Chinese colleagues had difficulties in providing a series of maps of the region that show past developments, the present situation and short and long-term developments. For our Chinese colleagues it seemed that past, present and future are not to be separated’. 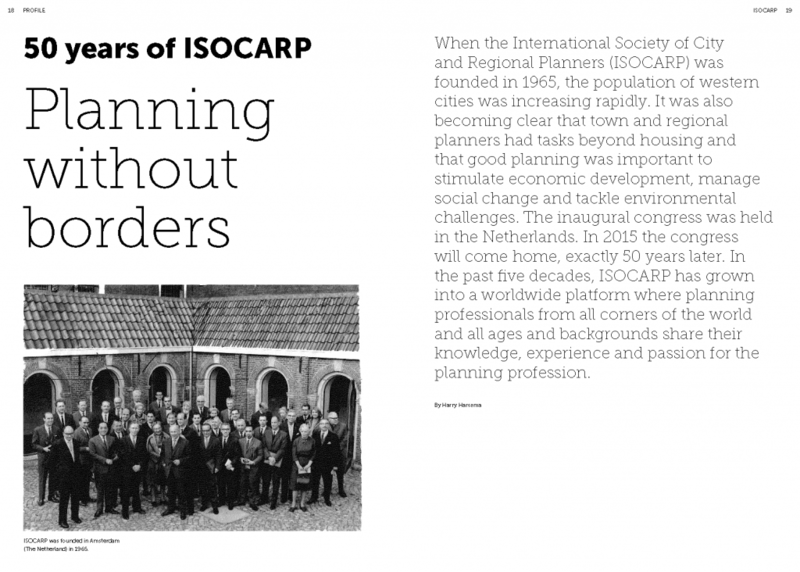 The article ’50 years of ISOCARP, Planning without borders’ by editor in chief Harry Harsema is published in Scape Magazine #14, August 2014, page 18-27.